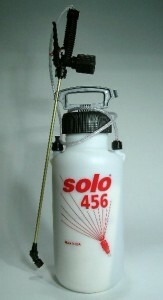 The Solo 2 Gallon Foamer comes standard with a 20 inch wand and pressure guage. Though the tank and components are made of plastic, this foamer is quite durable. Ideal for wall void and plant/landscape tasks, it features the largest tank which means less refills during any large job. And a lot more economical as well since the required FOAMING AGENT is inexpensive and goes a long way. This could be important depending on the task at hand. There is one tip featured below, a 12 inch Slab Injector, that will make it suitable for most any slab or wall treatment. You can save the cost of this option by just cutting down the 20 inch wand that comes with it but only do this if you intend on treating wall and/or slab voids and don’t expect to need the wand featured above. If you expect to be using the Foamer for a multitude of uses, keep the 20 inch wand as is and get the optional injector shown below. Watch our video on this foamer which shows how it works, what the foam looks like when applied and just how rapidly foam can be pumped. The 12″ Slab Injector should be used when making treatments sub slab and you don’t want to cut down the wand that comes with the Foamer. Get the Foamer and the Slab Injector together as a kit for a $5.00 savings.